— Although Donald Trump is remaking the Republican Party in his image, he had among the shortest coattails of any presidential winner going back to Dwight Eisenhower. In 2016, Trump ran ahead of just 24 of 241 Republican House winners and only five of 22 Republican Senate winners. — While more Republican House members are from the South than any other region, Trump’s coattails were longest in the Midwest, where he ran ahead of nine Republican House winners. Trump ran ahead of eight victorious GOP House candidates in the South, and a combined total of seven in the two Democratic bailiwicks, the Northeast and the West. — The length of presidential coattails over the years has been closely related to the winner’s share of the popular vote. Landslide victories (say, with 55% or more) tend to produce much longer coattails than those of “minority” winners such as Trump. But in the eight presidential elections from 1988 to 2016, there has been nary a landslide and the length of presidential coattails has shrunk. It is one of the ironies of modern American politics that congressional Republicans have bound themselves virtually en masse to a president with some of the shortest coattails in a generation. For better or worse, Donald Trump has immersed himself in GOP politics — from fundraising to endorsing (and opposing) candidates to holding his patented campaign-style rallies for his favorites. But offering coattails for Republican candidates? Well, not so much. The only time Trump has had a chance to exhibit his coattail pull came on Nov. 8, 2016, when he was elected with a solid 304 electoral votes but only 46.1% of the popular vote — 2.1 percentage points behind Democrat Hillary Clinton. Of the 241 Republican House candidates elected at the same time, Trump outran just 24 of them — or put another way, one out of 10. It was the smallest demonstration of coattail pull by a presidential winner since 1992, when Bill Clinton’s 43% of the vote in a three-way race with President George H.W. Bush and Ross Perot enabled him to run ahead of just five House Democrats. Some might argue that Trump’s brash, anti-establishment campaign struck a chord with many voters and helped set the tone for Republican victories in 2016. But when it comes to the quantitative side of presidential coattails, the vast majority of Republican House members owe Trump virtually nothing. The same goes for the Senate, where Trump ran ahead of just five (of 22) Republican Senate winners in 2016. 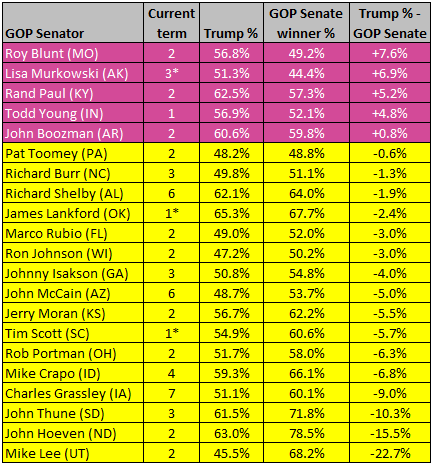 All of the Trump-led senators were in red America: Roy Blunt of Missouri, John Boozman of Arkansas, Lisa Murkowski of Alaska (who was involved in a three-way race), Rand Paul of Kentucky, and Todd Young of Indiana. However, in swing states where control of the Senate was decided, Trump consistently drew a lower percentage of the vote than the Republican winner. He trailed Pat Toomey in Pennsylvania by six-tenths of a percentage point, Richard Burr in North Carolina by 1.3 points, Marco Rubio (his erstwhile GOP sparring partner) in Florida by three points, Ron Johnson in Wisconsin also by three points, John McCain in Arizona by five points, and Rob Portman in Ohio by fully six percentage points. Note: Each senator’s current term is based on full terms in office. An asterisk (*) indicates that the senator served an unfilled portion of a previous term before winning a full term. Percentages are based on each candidate’s share of the total vote. 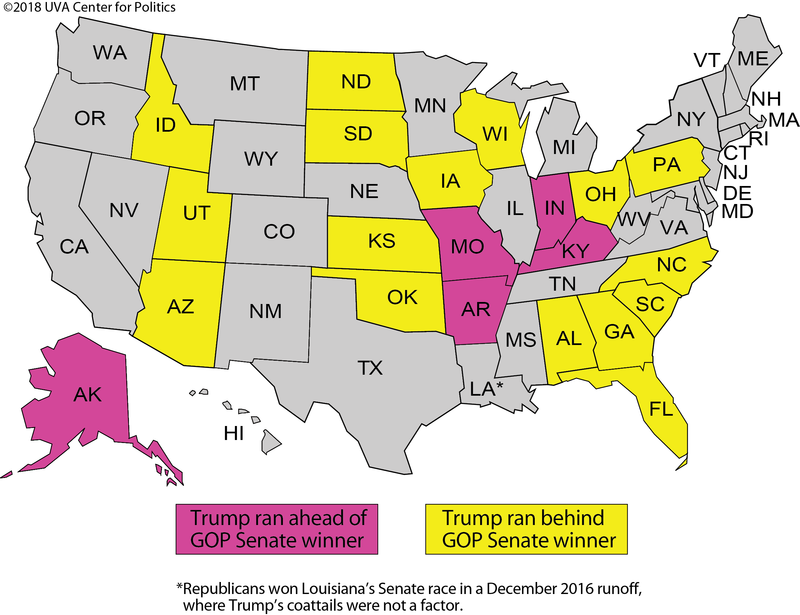 A Republican Senate victory by John Kennedy in Louisiana is not included in the table because it was not secured until a December runoff when Donald Trump was not on the ballot. Source: America Votes 32 (CQ Press, an imprint of SAGE). Yet when discussing presidential coattails, the focus is usually on the House — one, because Congress’ lower chamber has historically been more susceptible to the ebb and flow of national elections; and two, because in presidential election years, the House is the only other office contested in all 50 states. To be sure, the quantitative measurement of presidential coattails has its limitations. The count includes all congressional districts in which the presidential winner drew a higher percentage of the vote than his party’s House winner, regardless of whether help from the top of the ticket could be considered crucial to victory or not. The list of Trump’s coattails, for example, includes Jason Smith of Missouri, who was reelected in 2016 with 74% of the vote at the same time that Trump was carrying his district with 75%. That counts as a presidential coattail, even though no one would seriously make the argument that Smith needed Trump’s help to win election. A more meaningful tally of coattails would probably be limited to districts in which the presidential winner ran ahead of his party’s marginal House winners, defined here as those who drew less than 55% of the total vote. 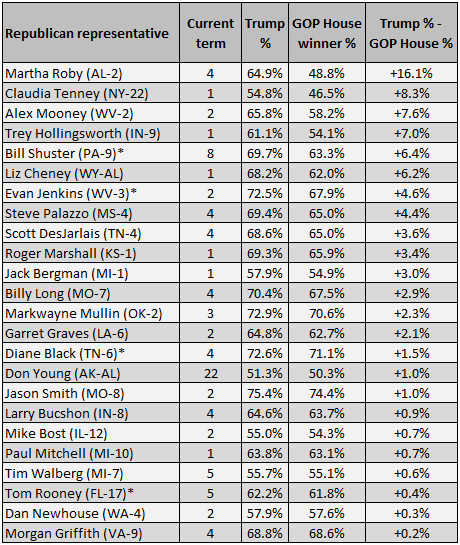 In 2016, there were six Republican House marginal winners who ran behind Trump: Martha Roby (AL-2), Don Young (AK-AL), Mike Bost (IL-12), Trey Hollingsworth (IN-9), Jack Bergman (MI-1), and Claudia Tenney (NY-22). 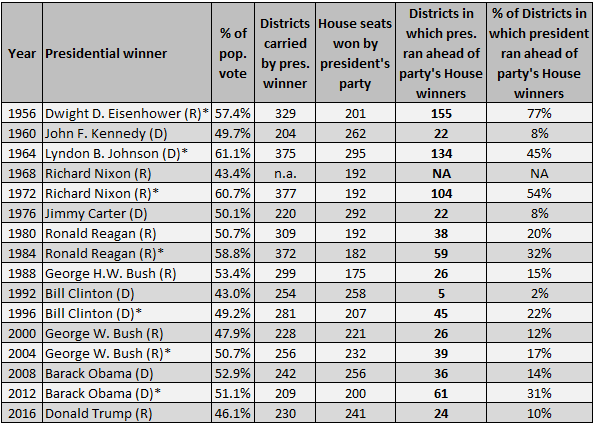 Still, the count of presidential coattails traditionally uses the broader definition of the number of districts in which the presidential winner outruns his party’s House winners, regardless of the percentage. In 2016, the “Trump 24” was largely made up of “backbenchers” unknown to the average voter. A dozen of those that he outpaced were relative newcomers to Congress, currently in their first or second terms — a number that included Liz Cheney, the daughter of the former vice president. She was elected to Wyoming’s open at-large House seat in 2016 with 62% of the vote as Trump was sweeping the state with 68%. Donald Trump ran ahead of 24 of the 241 Republican House winners in 2016, which translates into only one out of every 10. The number was compiled by comparing the percentage of the total vote won by Trump with that of victorious GOP House candidates in their districts, regardless of how large the percentage for each. The “Trump 24” were spread across the country from Florida to Alaska, and were generally lesser-known House members. A dozen were relative newcomers, elected in 2016 to their first or second terms. In contrast, Republican House leaders tended to run far ahead of Trump in their districts. An asterisk (*) indicates that the Republican representative is not seeking reelection in 2018 or is running for another office. Notes for Tables 2a and 2b: “Current term” is based on the number of full terms. Districts are not included as coattails where the vote share received by Trump and the Republican House winner was the same. Cases in point, IN-2, where Trump and Rep. Jackie Walorski each drew 59.3% of the vote, and MT-AL, where Trump and Rep. Ryan Zinke each received 56.2% of the vote. Trump coattails also do not include the two Louisiana districts where the Republican House victory was not settled until the December 2016 runoff. Sources for Tables 2a and 2b: The 2016 presidential vote by congressional district was compiled by Daily Kos Elections, and was used by the author to derive the extent of Donald Trump’s coattails in 2016. The 2016 House vote is from America Votes 32 (CQ Press, an imprint of SAGE). The number of terms served by House members is from The Almanac of American Politics 2018 (Columbia Books & Information Services, National Journal). In contrast, Republican House leaders routinely outpaced Trump. House Speaker Paul Ryan (WI-1) was reelected in 2016 with 65% of the vote, 12 percentage points higher than Trump’s showing in his district. House Majority Leader Kevin McCarthy (CA-23) won with 69%, 11 points ahead of Trump. And House Majority Whip Steve Scalise (LA-1) took 75%, running six percentage points better in his district than the GOP standard-bearer. Even Devin Nunes (CA-22), who has been criticized as a lackey of the president as chairman of the House Intelligence Committee, far outperformed Trump in his California district. The tally: Nunes, 68%; Trump 52%. The examples of presidential coattails in 2016 often tended to involve congressional districts that were geographically clustered and rural in character. Three Trump-led districts were in Michigan. Another trio were in the Appalachian coal country of West Virginia and the adjacent Virginia panhandle (the “Fighting Ninth”). A pair of Trump coattails was in southern Indiana; another two were sprawled across southern Missouri; and two more were in Middle Tennessee. Far more common, though, was the absence of Trump coattails in large Republican delegations. He outran none of the 10 GOP House winners in Georgia, none of the 10 in North Carolina, none of the 12 in Ohio, none of the 14 in California, and none of the 25 in Texas. Donald Trump and Republican House candidates each received an almost identical number of votes in 2016, with Trump getting 62.985 million and the plethora of GOP House candidates totaling 62.977 million — a difference of less than 10,000 votes. But since there were almost 8.3 million more votes cast for president than the House of Representatives in 2016, the percentage of the vote won by Republican House candidates was three percentage points higher than the percentage for Trump in the presidential race. The latter lost the total popular vote to Democrat Hillary Clinton, 48.2% to 46.1%, while the GOP House vote exceeded the aggregate nationwide vote for Democratic House candidates, 49.1% to 48.1%. 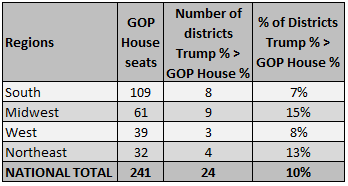 Altogether, Republican House candidates carried 11 more congressional districts than Trump, 241 to 230. By far, more Republican House members are from the South than any other region. But Donald Trump’s coattails in 2016, as they were, were longer in the Midwest. There, he ran ahead of nine Republican House winners, based on a comparison of the Republican presidential and congressional vote percentages in each district. Trump ran ahead of eight victorious GOP House candidates in the South, and a combined total of seven in the two Democratic bailiwicks, the Northeast and the West. South (13 states) — Alabama, Arkansas, Florida, Georgia, Kentucky, Louisiana, Mississippi, North Carolina, Oklahoma, South Carolina, Tennessee, Texas, Virginia. Midwest (12 states) — Illinois, Indiana, Iowa, Kansas, Michigan, Minnesota, Missouri, Nebraska, North Dakota, Ohio, South Dakota, Wisconsin. West (13 states) — Alaska, Arizona, California, Colorado, Hawaii, Idaho, Montana, Nevada, New Mexico, Oregon, Utah, Washington, Wyoming. Northeast (12 states) — Connecticut, Delaware, Maine, Maryland, Massachusetts, New Hampshire, New Jersey, New York, Pennsylvania, Rhode Island, Vermont, West Virginia. Sources for Tables 3a and 3b: The 2016 nationwide presidential and House votes are from America Votes 32 (CQ Press, an imprint of SAGE). The presidential vote by congressional district was compiled by Daily Kos Elections. The author used the latter data to compute the extent of Donald Trump’s congressional coattails in 2016 by region. The length of presidential coattails over the years has been closely related to the winner’s share of the popular vote. Landslide victories (say, with 55% or more) tend to produce much longer coattails than those of “minority” winners such as Trump. In most of the 20th century, landslides were the norm. Nearly half of the presidential elections from 1900 through 1984 — 10 of 22 — were won with at least 55% of the vote. And with the landslide victories came some very lengthy coattails. In 1956, Republican Dwight D. Eisenhower won reelection with 57% of the vote and in the process ran ahead of more than 150 of his party’s successful House candidates. In 1964, Democrat Lyndon B. Johnson rolled to a 61% victory and outpaced more than 130 of his party’s congressional winners. In 1972, Republican Richard Nixon scored a 61% landslide win and outran more than 100 of his party’s House victors. But in the eight presidential elections since Ronald Reagan’s 49-state triumph in 1984, there has been nary a landslide and the length of presidential coattails has shrunk. Over the last three decades, most of the presidential winners have had coattails numbering in the 20 to 40 range. One has been below 20 (Clinton’s five in 1992); two have been above 40, paced by Barack Obama, who drew a higher share of the vote than 61 successful Democratic congressional candidates in 2012. While long coattails may no longer be in their quiver, presidents still have ways to influence national campaigns. They can use the “bully pulpit” to fashion campaign themes, something that Trump is trying to do now for 2018. He is also raising money, endorsing Republican candidates (most recently Senate aspirant Mitt Romney in Utah), and seeking to cajole and intimidate both friends and foes alike. With the Gallup Poll showing the president’s mid-February approval rating to be above 85% among Republicans, Trump will likely have his greatest impact this year in molding the party’s message and helping to define the list of nominees that Republicans will put before the voters in November. But with a Gallup approval rating of just 30% among independents, and barely 5% among Democrats, his role in the 2018 general election looks to be problematic. There is little doubt that the controversial Trump will be the central player of the 2018 campaign. Even while his name is not on the ballot, this year’s elections will offer a highly charged referendum on Trump and his presidency. Love him or hate him, it could result in a midterm variation of presidential coattails, or a lack thereof. The length of a president’s coattails is closely related to his share of the popular vote. Landslide winners generally have lengthy coattails, outrunning scores and scores of their party’s congressional winners, and in the process pulling many of them into office. Presidents with more modest winning percentages almost invariably have much shorter coattails. That includes Donald Trump, who was elected in 2016 with 46% of the total popular vote. He drew a higher share of the vote than just 24 Republican House winners in their districts. As a historical note: Landslide presidential victories were a feature of American politics into the 1980s, but since then presidential elections have been consistently closer. Note: An asterisk (*) designates an incumbent president. Percentages in the far right column that ended in .500 are rounded up to the nearest whole percentage point. Sources: The winning share of the total popular vote for president in each election since 1956 is from America Votes 32 (CQ Press, an imprint of SAGE). 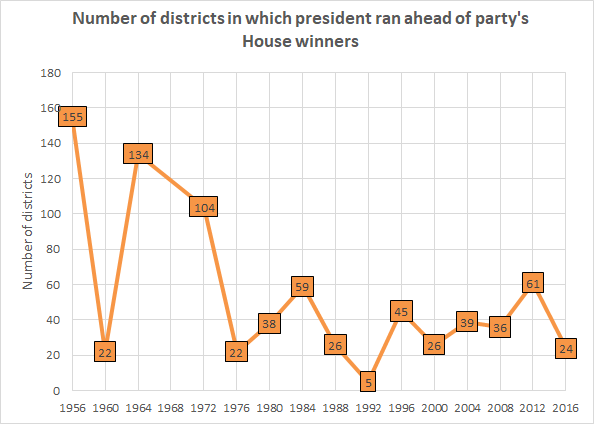 The number of House seats won by the president’s party is from the House clerk’s office. The number of congressional districts that the winning presidential candidate carried and the number in which he drew a larger share of the vote than a victorious House member of his own party is from Vital Statistics on Congress (updated September 2017) and covers elections from 1956 through 2012 (with the exception of 1968, a three-party election that Richard Nixon won with barely 43% of the vote). The data is found in Table 2-17 and has been posted on the Brookings Institution website. The 2016 presidential vote by congressional district was compiled by Daily Kos Elections and posted on its website. The author used the latter data to compute the extent of Trump’s congressional coattails in 2016. Rhodes Cook is publisher of The Rhodes Cook Letter and was a political reporter for Congressional Quarterly for more than two decades. He is a senior columnist at Sabato’s Crystal Ball.